This post announces the Sept.-Oct. edition of the NFPA Journal, which fittingly covers several school-related fire safety issues in recognition of Campus Fire Safety Month. The cover article, "Unsafe Science," explores school science lab experiments gone wrong, with examples and recommendations to improve safety in these all-too-common situations. Other related articles address the intersection of school security and fire safety, proposed legislation (U.S.) to require sprinklers in all college-run student housing, and fire museums in the U.S. and Canada. - The number of reported fires in college-owned and affiliated dormitories, fraternities, sororities, and student barracks has been increasing over the past 30 years; between 2003 to 2013, it increased a full 24% (NFPA data). - More deaths occur each year in off-campus housing. There have been four such deaths already in 2015. For comparison, on-campus housing fire fatalities have averaged two per year fairly consistently since 1980. -States like New York and Connecticut have recently passed laws requiring landlords to inform all tenants, including college students, about whether their apartments have fire sprinklers, furthering the cause of transparency and awareness of fire safety. Yes, this post is specific to the U.S., but it's also the Huffington Post, which means it's getting in front of a lot of people who don't frequent NFPA.org. The author advocates for passage of the same U.S. fire sprinkler legislation I mentioned earlier (also covered in the latest edition of the NFPA Journal). The thing to know about the legislation is that it is not meant to guarantee or require installation of sprinklers. Rather, it's intended to increase transparency and awareness of the fire safety technology in rented residences. That's interesting because in theory there should be much less resistance to such legislation (versus a sprinkler requirement with significant costs attached, as we've seen here in Ontario). This local news item from Eau Claire, Wisconsin got some shares for its practical tips for college students headed back to school. Local Fire Department Fire Inspector Michael Laska advised that while unattended cooking is the number one cause of residential fires, smoking, alcohol and non-working smoke detectors are the main causes of fatal fires. His tips for college students: verify the smoke detectors work, don't tamper with smoke detectors, get a fire extinguisher, a good surge protector and don't forget renter's insurance. Sound advice! This is a reminder for college students and their parents to remember fire safety when getting ready for back to school. The author directs readers to NFPA's College Campus Fire Safety tips sheet which includes safety information about smoking, candles, cooking safety, smoke alarms and escape planning. This September 1st through 25th, college students can enter the Campus Fire Safety Sweepstakes & Contest to raise awareness of campus fire safety. The contest is co-sponsored by the NFPA, The Center for Campus Fire Safety, The University of New Haven Fire Science Club and Domino's Pizza. Get information about the contest here. (Yup, pizza is involved!). Covers mostly U.S.-based campus fires, is published by a former chief fire investigator for the NFPA. They have also compiled a great list of questions to ask when touring colleges and looking at on or off-campus housing. Serving all of North America, the Center is a non-profit organization devoted to reducing the loss of life from fire on campuses, they also serve as a clearinghouse for information relating to campus fire and life safety. 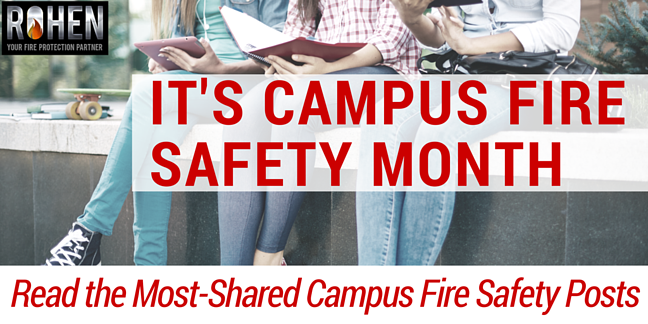 See their Resource Library for a wealth of campus fire safety information. They also have a list of tips and fire safety facts in their Campus Fire Safety Month section. Get tips, checklists, fact sheets, infographics and questions to ask your school and landlord. Do you know a college student (or their parents)? 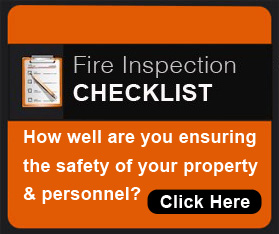 Send them this list to give them a head start with fire safety this year. Click here to share this post on Twitter.